As you can probably imagine, I am behind my memory project. But you know what? That happens, and I will try to catch up pretty soon. While enjoying the company of our friends these past weeks, I was not able to fully devote myself to memorization, but I did keep reading Titus and Bryan Chapell’s commentary. The thing that really impressed my heart was to read all the characteristics that a godly man, apt for the service of the Lord, should display. As a mother of two sons I saw this list as a guideline on what I should strive to see in them. If you have young kids, focus on these character traits to teach them what a real man is; and if your sons are young adults living far away from you, pray earnestly that they will be able to display these characteristics, by the grace of God, in all their manner of living. These characteristics are also a great way to teach our sons about what a true Christian friend is. Choosing our friends is not an easy task, we need the Word of God to help us discern who can truly help us grow in the faith and in our relationships with others. Our daughters should also know this list of characteristics well, and keep it before their eyes. We certainly want them to marry God-fearing men and this list will certainly help them discern who could make a godly husband and father. As wives, we could also use this list to pray for our husband. What a blessing to be able to intercede for them according with the Word of God! Being “above reproach”: Our sons must be taught that they only have one reputation and they must do all that is in their hands to keep it clean, above all men’s reproach. “Husband of one wife”: My husband and I truly believe that we must teach our sons to have an “only-one-woman heart.” They need to learn how to depend on God’s means of grace to keep themselves pure for their wives, and because of the love that they will have for their wife, they should start now practicing self-control. We have taught them that the attitude of being faithful to their wife starts now, in their heart, not only after marriage. “He must not be arrogant”: Oh how much I pray that my sons and sons in law will be humble men! Always with a heart willing to learn, to seek and receive advice. Always open to grow and admit their faults and sins. Always dependent on God’s all sufficient Grace. “He must not be quick-tempered”: Chapell says that “this is a reference particularly to the kind of temper that flares at others.” We cannot stress the importance of this too much. It is vital. He who is quick-tempered will be like a city without a protection wall. “He must not be violent”: Moms of young sons, please, please, please, never let your little one respond violently (even with tantrums) to you or anybody else. Let us be diligent in teaching our sons how violence goes beyond physical abuse. Words-or the lack of words- can certainly be violent. Actions can also be violent and destroy and bring death. “He must not be greedy for gain”: Our sons must learn the value of hard work. Let us teach them not to put their trust in riches lest they will fall (Prov. 11:28), and that they don’t last forever (Prov. 27: 24). Now we see in Paul’s epistle to Titus six positive qualifications, all of them having an impact on others. Our sons must learn that a godly man influences others. Being holy and godly is not a “personal” thing, it always reaches out to others. “Hospitable”: Being hospitable is something that we talk about among women. But surprisingly, being hospitable is a characteristic of a godly man. And maybe it is more surprising that being hospitable is not listed in this epistle as a characteristic that a godly woman must have (see ch. 2: 3-5). “A lover of good”: Chapell says, “particularly loving virtue or what promotes good for others.” What is it that they talk about among their friends? What is it that they enjoy the most? Paul in his epistle to the Philippians tells us what are the kind of good things that we must train our minds to think about (Phil. 4:8-9). “Self-controlled”: in Chapell’s words, “Controlling drives that lead to impulsive and damaging behavior.” How I pray that my sons rely on God’s Word to be self-controlled. To die to self and grow in Him. “Upright”: Teaching our sons to align their lives to the Word of God is a must. The world will always offer them an easier way to live, a more “pleasant” life to live. The only way for them to live upright, is to treasure God’s Word in their hearts, pray and depend on God’s amazing and unfailing grace. “Holy”: Separated from the world, not conformed to it. Willing to think and act differently than the fool who lives as if there were no God. These last six characteristics have to do with a blameless behavior, but how could it be possible for our sons to live up to that standard? Only by holding firm to the trustworthy Word as taught to them. Only when they hold fast to the Scriptures, in spite of all their shortcomings and sinful nature, will they be able to stand blameless not only before God, but also before the Church of Christ. There is upon my shoulders a heavy burden to persevere in prayer for my sons and the future husband of my daughters; that they may hold firm to the Word of God and live an open life before our Most Holy God. 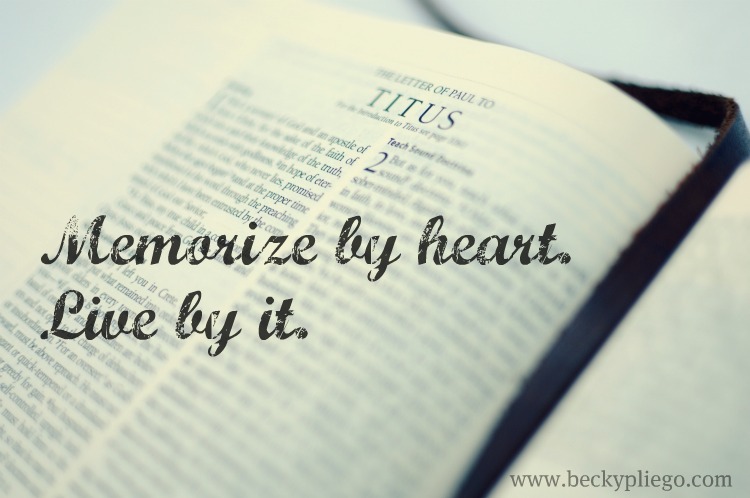 This entry was posted in Memorization, Sons, Titus by Becky Pliego. Bookmark the permalink. Excellent post Becky. Your children are so blessed to have you as their mom. I am so grateful for godly leadership at my church and my home, whom my three sons can follow and witness. How wonderful these counsels are from the Lord. Thank you for sharing dear Becky! We are working through Titus at church. Thanks for the mention of the commentary – I will be looking it up. I've recently begun preaching through this short letter of Paul to his son in the faith, Titus. One of the things I pointed out, from this list of spiritual qualities, was a quote from D.A. Carson: “One of the more remarkable things about this list of qualities is how utterly unremarkable they are.” In other words, these are “ordinary” things which you and I, every Christian, is to have within our own life. It just so happens that those who would be elders must have them and be those others would long to emulate because of that fact. Good prayers for your sons, Becky. Thanks for this post.